Neil Gaiman www.NeilgaimanBoard.com www.NeilgaimanBoard.com Neil's Other Works Anansi Boys Has anyone ever had a "lime" experience? Has anyone ever had a "lime" experience? "You are the one with the lime?" Has anyone had an experience like Fat Charlie? Actually I have... In our speech class we had a debate. And, I was one of the people who sorta argue the point. anyway, the day afterwords a bunch of teachers, some I didn't know came up to me and kept saying "Hey I heard you did good in the debate" I was just like... yeah, sure... Sorta like how people would say "You're the one with the lime!" does this count? when royko saw me in the elevator (and i didn't know he was royko) and he asked "are you the llama girl?" and i thot my god. how do complete strangers know that i'm a llama?!! I do a lot. It may be because I have a crappy memory for people/faces/names. See, I go to an art school. I only take night classes (cuz I work) AND I have taken two years off. But I will be walking down the street, and people will yell my name, and wave. (My name isn't a terribly common one) I will show up at school, and complete strangers know me. No clue why or how. Like I said, it's most likely my crappy memory, but people recignize me. Heehee, I remember one New Year's Eve I was spending with family and friends in a village at the mountains. The apartment is on the edge of the village, so there's just a hotel on one side and fields on the other. After midnight, we had our traditional New Year's Eve Fireworks. After tha, my sister, another girl and me went to the pubs, only we stopped at the kids swings for a wile coz it was fun, and dark and creepy. Not so much an experience, but I do handle limes on a regular basis! I suppose my closest would be this. I recently took part in a play at a university across from mine. Mine is Liverpool, the other one is Liverpool Hope. So my face is seen regularly in both places. And now when I wander through town or the supermarket alot more people smile at me or wave, etc. So it seems I know lots more people except I know nobody's name and they don't know mine. Mal: "But she does have an oddness to her. And I ain't just talking about her proficiency with firearms. Girl knows things. Things she shouldn't. Things she couldn't." Jayne: "Wha-...are you-are you sayin' she's a witch?" Wash: (sarcastically) "Yes, Jayne. She's a witch. She has had congress with the beast." Wash: (amazed) "How did your brain even learn human speech? I'm just so curious." I have looked in many places but can find no answer to the quesion "What was the lime for on your desk at the Manchester signing?" I meant to ask at the time but blurted out something tedious instead. 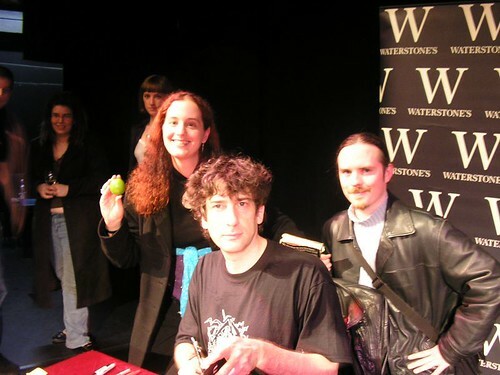 Here's the photo of me, Kat, Neil and the Lime. The signing took place before either Kat and I had read Anansi Boys, so we were both wondering why he had the lime. The signing took place on his birthday, so like a good little fan boy and fan girl, we gave Neil a couple of gifts. He gratefully accepted them, then said "Here, have a lime," which we gratefully accepted, with some confusion. We didn't ask, and didn't get it until we read Anansi Boys. yes actually, i was on this island in the hebrides (north scotland) and i got stung by a bee. i went to the store fifteen minutes later and then the shop assistant said 'oh, you're the one who got stung by the bee' and it was the same at the hotel and resteraunt. Yes... when i started dating my boyfriend (you know, the one i don't ever shut up about?) well, it happened in one class, and then in my very next class I was getting these huge congatulations, and I was all like... What? And everyone was all about how we hooked up. For the next week we were refered to as "the one who's going out with _______". I'm not sure that that counts, but the whole recognition within minutes that lasts for a while made me consider it. Actually, though not because of some object or an event, I was recognized because of my, previously, long hair at a new school I went to. One way or another, I seemed to be very well like by my peers from middle school and word of mouth made it so when I moved to this new school with a lot of my old friends, many a stranger knew me by my last name or 'hey so you're the guy with the nice hair?' Although by now it isn't long anymore, but still, they knew by that. There was also the time, in a San Antonio mall, where I accidentally tripped over something in my way, can't remember what, and into a large cart - the kind where they sell things off of, this one sold toys - and then just walked away very quickly. I couldn't approach another cart without being teased, 'you're not going to fall on mine, are ya?' or somehting to that effect. Sort of, although not nearly so hard to understand. I work for a large international banking concern and I have a fondness for wearing kilts. I get a lot of "So, where's the kilt? ", from complete and total strangers. That and "hey, what family is that? ", this last one is a trifle odd given that I was wearing a Utilikilt and it was black . . .
Am trying to instill the word "gruntled" into daily conversations. Yes, I've quite literally had a "lime" experience. Back in the summer of 98 I spent a month in Knockpatrick, Jamaica doing a bit of construction work for a school down there. I'd get up and start work every morning round about five oclock and work till eleven when I stopped for lunch and siesta. I'd stroll down into the market to grab some lunch but early on decided I would try one new food every day. So after a week of eating pasties, pepperpot and curry for lunch I just wanted something sweet and juicy. I bought a soursop and sat down to enjoy my meal. That whole week I bought some strange fruit or another with my lunch and ate them sitting under a mango tree. Towards the end of my second week, one of my fruit guys gives me a whole bunch of guineps (think something the size of a banana bunch or huge grape bunch of golf ball sized fruits, roughly 3ft dia tapering down over four feet) for me and the other guys back at the school, no charge. Needless to say he bought both my business and that of my friends with his generosity (I later learned he had a daughter in the school so he appreciated me as much as I did him), but I was forever known as "Nippy" in town. It seems that a white boy walking five miles up the mountain with a bunch of guineps on his back is an image that stick with you. Yes, I have been named after a fruit while on a tropical island in the caribbean. If that's not a lime experience I don't know what is. A tad bit embarrassing this, but here goes. I was vacationing in Belize and was off the coast in one of the many little Caye islands, when I found myself stung soundly on my hand by a sea urchin. It just so happened that the week before we were talking to some people in Placentia (or as I like to refer to it, the most perfect town ever!) that boiled water with vinegar and salt does the trick of removing and soothing the stings of a sea urchin much better than the more hilarious method of peeing on the affected area (ammonia removes stingers and neutralizes neurotoxins). After the sting I went from house to house asking kindly for vinegar. I was willing to barter virtually anything, even a badly mocked up sand dance, but all the locals continued to tell me just to pee on it. Finally, our hotel manager also informed me that I must pee on it and I knew my final recourse was to do the unthinkable. I must say it was more uncomfortable a thing to do than I imagined it would be-primarily because you can't wash your hands afterwards. The post-operation procedure seemed to be milling around looking mildly uncomfortable, smelling rather awful, and not knowing what to do with my hand. The next day I was asked repeatedly if I had peed on my hand, and I bashfully replied the affirmative. From then on I was known as the pee girl, or hey pee girl, etc. Somebody else who knows Placencia! I call it the Home Of My Heart. Quick Reply to: Has anyone ever had a "lime" experience?